Silver is the color of the gleaming moon and shining stars. 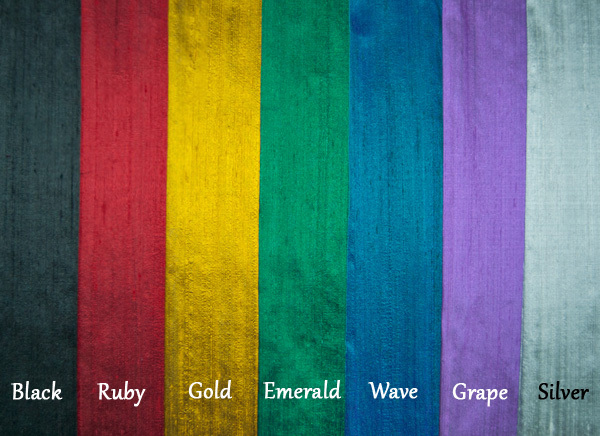 It is the color of the ebb and flow of tides and of divine feminine energy. It is fluid and intuitive, mysterious and purifying. Like in the Moon card in a tarot deck, silver gently illuminates our path forward. 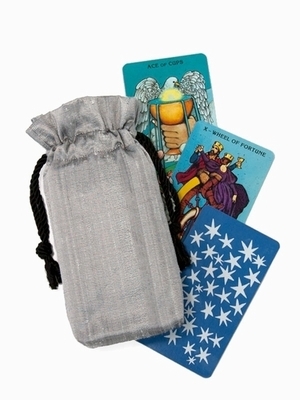 When you safeguard your tarot cards in one of our Silver Silk bags, you infuse it with the energy of moonlight every time you put away your deck. The picture doesn't do justice to what this silver silk looks like in person. it shimmers and shines like moonlight on water. Click on the image below to get an idea of what we mean. Deck Suggestions: Most decks pair very well with this silver silk tarot bag, but here are some of our favorite matches. Click on the image below to see a closeup of the silk lining choices. Bag Design: The edges of our double draw bags are finished with a rolled hem. The bag closes with two triple twist drawstring cords that create a 1" ruffle effect when closed. The bottom of the bag is squared off (gusseted) for a more tailored fit for a deck of cards, or a deck in its box. Size: Each bag measures about 4-1/2" x 7-1/4" x 1" (approx. 11.4 x 18.4 x 2.5 cm). The width varies in proportion to the depth of the deck (thicker decks lead to a narrower fit).